Uranus is unique among all the planets of the solar system because it essentially orbits on its side, with its axis tilted nearly perpendicular to the Sun. Now astronomers have finally solved the mystery of why Uranus looks so strange. 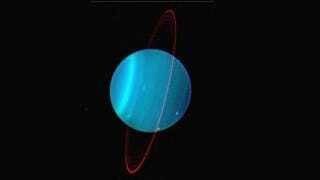 Uranus's spin axis lies 98 degrees off of its orbital plane with the Sun. No other planet is tilted more than 30 degrees off its axis, with the Earth rotating at 23 degrees, Jupiter at just 3 degrees, and Saturn and Neptune both at 29 degrees. Venus is technically even more tilted, because it rotates clockwise when all other planets rotate counterclockwise, meaning it's essentially been turned upside-down. But it's still more or less on the orbital plane, while Uranus is anything but. Figuring out just how Uranus got like this has proven tricky. Astronomers once assumed that a giant planet several times Earth's size smashed into Uranus in the early solar system, flipping it into this new axis. The problem with that idea is that it would have left all Uranus's moons in the original orbital plane, but they're also tilted 98 degrees. A research team led by Alessandro Morbidelli ran a series of simulations to explain this mystery. They found that the current positions of Uranus's moons could be explained if the planet was struck when it was still surrounded by a protoplanetary disk, which is the band of material from which the moons ultimately formed. The collision would have destroyed the disk, which would then have been able to reform around Uranus's new tilted equator. But that still doesn't work - according to the simulations, the moons that would have formed from that process would have to orbit Uranus in the opposite direction of what we observe. A single collision couldn't create the current Uranus system, so instead the astronomers revised the simulation to see what would happen if at least two collisions occurred. It turns out that a series of collisions could indeed make Uranus's moons orbit in the right order. "The standard planet formation theory assumes that Uranus, Neptune and the cores of Jupiter and Saturn formed by accreting only small objects in the protoplanetary disk. They should have suffered no giant collisions. The fact that Uranus was hit at least twice suggests that significant impacts were typical in the formation of giant planets. So, the standard theory has to be revised." So then, one mystery solved, an even bigger one created. This is the trouble that so often comes from examining Uranus. But, on the bright side, I at least got to use some truly terrible Uranus puns, so I can walk away happy. Via Europlanet Media Centre. Image by Lawrence Sromovsky, (Univ. Wisconsin-Madison), Keck Observatory.